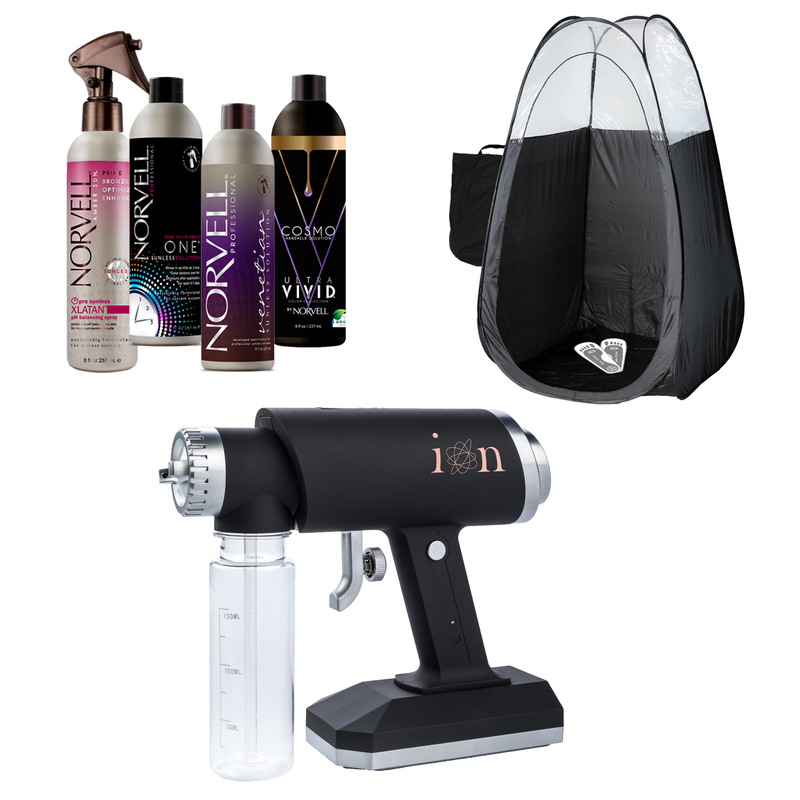 The Ion is a visionary instrument that marks a new era in portable spray tanning. The Ion is powered by an ultra-efficient Vortex engine -- a high velocity electric motor with the latest digitized computer control technology. There are no mechanical brushes to wear out or create carbon dust, just rapid-fire electronic pulses dictating ultra-precise engine control and speed. Revolutionary brushless 24 volt Vortex DC motor enables spray tan industry breakthroughs in form factor, low weight, low noise, reliability and long life. No carbon brushes to wear out or create dust. Big floor standing tanning machine performance in a hand held? Yes! Microprocessor chip fires ultra-fast, precise control signals that enable high performance in an ultra compact form factor. Weighs in at 1.53 lbs! Half the weight of the nearest competitor! Quiet? The quietest on the market! Rated at a mere 50 decibels. Modular, inter-changeable spray head for easy cleaning and quick solution change. Keep one for emergency back-up! Professional specs: stainless steel needle/nozzle, .5mm nozzle for ultra-fine atomization, 6 oz cup, supports horizontal and vertical fan spray patterns for broad coverage and quick application. Salon Powerful. Mobile Ready. Flawless, Streak-Free Tan. 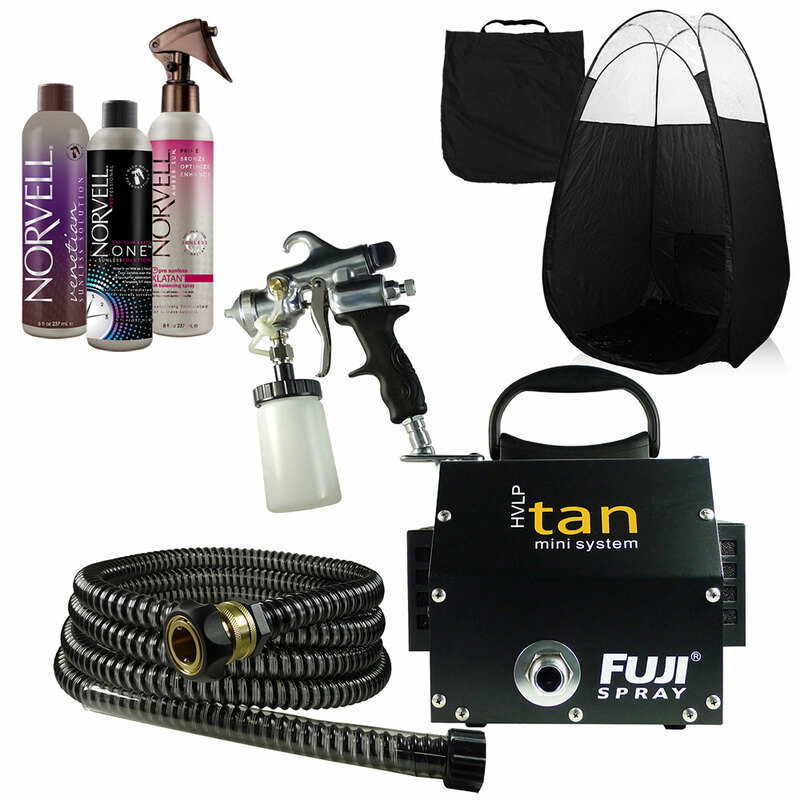 Ultra-Light, Ultra-Quiet, All-In-One Digital Spray Tan System. Simply Revolutionary! Simply ION. 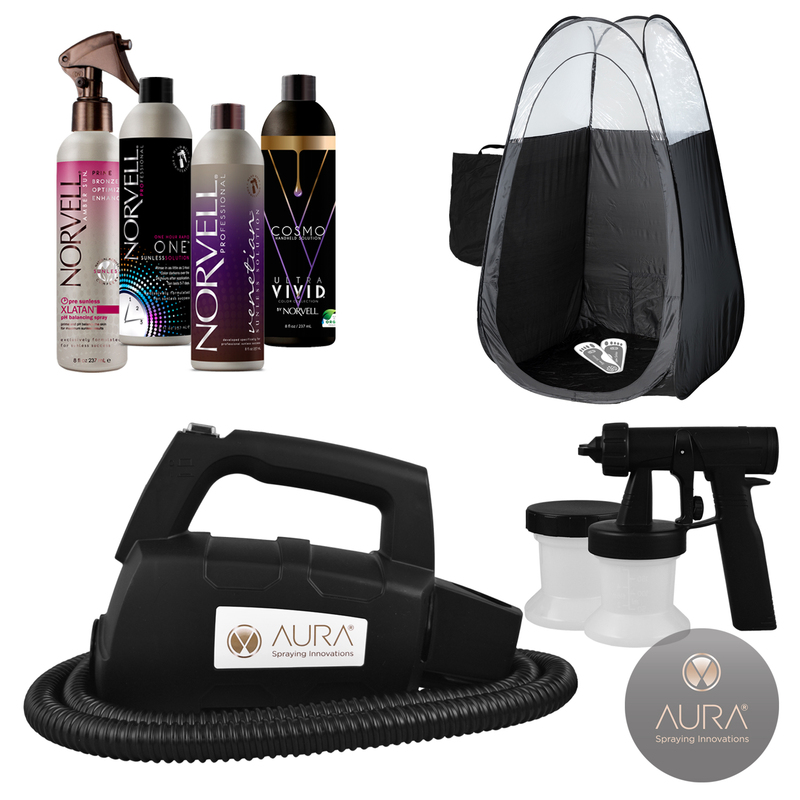 An ultra-compact, lightweight design makes it perfect for mobile tanners, but the unit is powerful enough for a salon setting too. Case design and internal motor enclosure walls off noise for super quiet operation. Satin Spray Nozzle Technology. Luxury Salon Design: Gloss black and metallic bronze. Whisper Quiet Turbine. Cable Management. Retractable Carry Handle. Gun Holder. Long Flexi Hose. Lightweight and Portable. 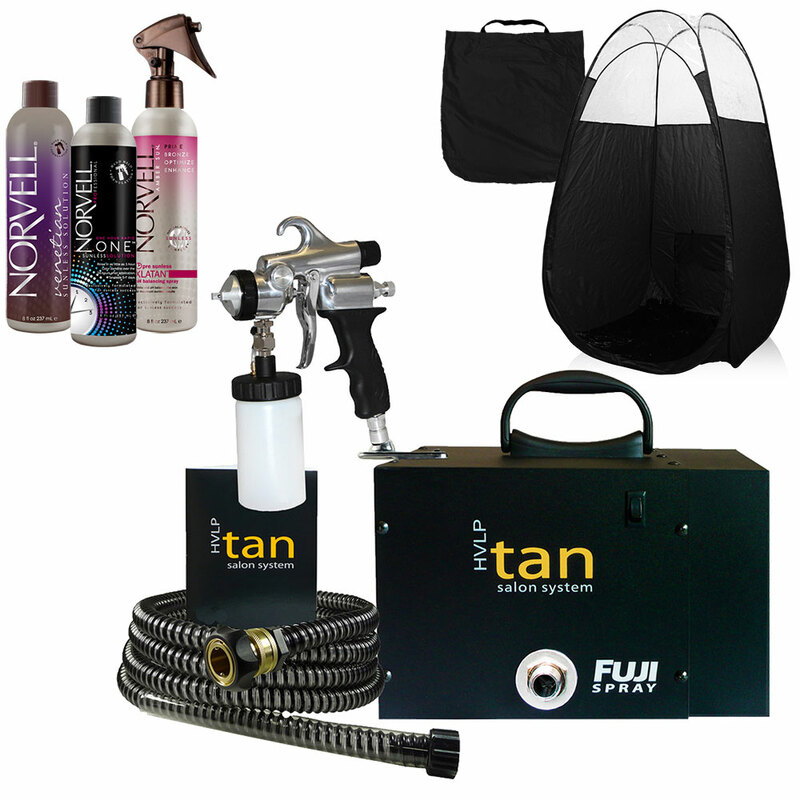 The Fuji HVLP Tan system is compact and agile, perfect for mobile applications. A small price for a mobile kit! Simply the finest piece of spray tan equipment in the world! Patented Quiet Turbine technology and Aim & Spray simplicity make The Fuji Ultra Quiet HVLP Salon System a favorite for salon technicians.